Kari and Jim M. : 14 years and LIVIN’ STRONG!! IMPORTANT!!! The previous report of a CFHR athlete having MRSA was false. The tests came back negative. Please continue to clean up your blood, sweat and skin and disinfect your equipment and mat space with the Lysol and rags. LEAST FAVORITE WOD-anything w/ elbows (cleans) or BURPEES!! PROUDEST CROSSFIT MOMENT: conquering the box after my fall when I first started crossfit. 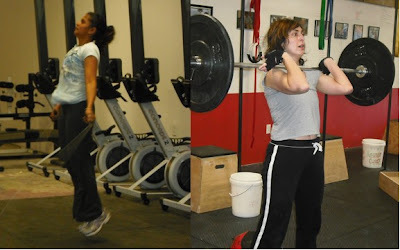 MY CROSSFIT EXPERIENCE – comaraderie w/ fellow crossfitters….all the thrash talking is right up my alley! 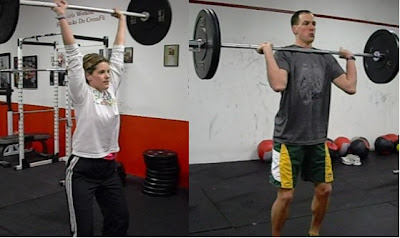 The chemistry w/ Nicole & Jeremy and the fellow crossfitters is great…you can’t get that anywhere else. I see myself pushing harder because of the support I receive not only from J & N but from fellow crossfitters. NEVER A DULL MOMENT!!! LEAST FAVORITE WOD: I had Burpees! OK, WE HAD OVER 20 PEOPLE RESPOND TO THE POLL EXPRESSING INTEREST IN ORDERING. AS OF TODAY, ONLY 3 PEOPLE (INCLUDING ME) HAVE ORDERED. REMEMBER, CFHR PICKS UP 50% OF YOUR SHIPPING COSTS. THIS IS ONE OF THE ONLY PLACES IN THE U.S.A THAT SHIPS 100% GRASS-FED MEAT (NO GRAINS….EVER!). WE ARE 51 LBS SHORT OF RECEIVING A GROUP DISCOUNT OF 12%. THIS MEAT IS PHENOMENAL…YOU WON’T REGRET ORDERING. TO ORDER, CALL 1-866-SLANKER. REFERENCE THIS LINK FOR PRICES, MEAT AND CUT TYPES. THE ORDER SHIPS NEXT TUESDAY! Check out this great video of Robb Wolf discussing protein sources (teaser…he discusses dairy, vegetarian and beans…just not as great sources of protein). Another great day of interaction and coaching from our newest trainer, Justin, during the lunchtime classes. Don’t miss this opportunity to hit the gym when it’s a bit less crowded and to get great instruction from one of CrossFit’s greats! 11-12 and 12-1pm! This Saturday, June 6th, is the Anniversary of the death of a great American Hero. Lt Mike Murphy, USN SEAL, was killed in action in Afghanistan. His actions earned the Congressional Medal of Honor. The workout “Murph” is named for him. He had named the workout “body armor” and it was one of his favorites. NavySeals.com and the Naval Special Warfare Foundation (of whom we are HUGE supporters) are hosting a nationwide Navy SEAL Hero Challenge (aka “Murph” day). This Saturday, CFHR’s doors will be open to absolutely anyone who wants to participate in the WOD “Murph” to help honor this warrior. Donations for the NSW Foundation will be accepted (we are currently doing a joint CFHR/NSW fundraiser involving sending our Affiliate Team to the games…please do not feel pressure to donate twice–a substantial amount will be donated to the NSW Foundation). Here is the link to the flyer. We will start during the 11:30 WOD time.